Deputy PM Nick Clegg calls the Iraq war "illegal" and says Yarl's Wood detention centre will close, as he becomes the first Lib Dem leader to take prime minister's questions. But the Home Office tells Channel 4 News it is only the centre's "family unit" which will close. Stepping in at the weekly Commons clash while David Cameron is in the States, Clegg said the government would make an announcement "shortly" on the closure of the controversial immigration detention centre. However the Home Office has told Channel 4 News's Home Affairs Correspondent Simon Israel that it is only the centre's "family unit" that will close, and not the whole of Yarl's Wood. When Channel 4 News gained access to Yarl's Wood last year, 33 children were being held. The coalition agreement promised to "end the detention of children for immigration purposes". During a raucous session of PMQs in which the Speaker intervened several times to call order, Clegg said: "It was simply a moral outrage that last year the Labour government imprisoned behind bars 1,000 children who were innocent of any wrongdoing whatsoever. "This coalition government like so many other things will once again restore a sense of decency and liberty to the way in which we conduct ourselves. "That's why I can confirm that the government will come forward shortly with an announcement about how we will deliver on our pledge to end child detention and to close the Yarl's Wood detention centre for good," he told the Commons. The Lib Dems later issued a press release hailing the "closure of Yarl’s Wood detention centre" as a "victory for British decency". The statement made no mention of the fact that only part of Yarl's Wood would shut. But the Home Office confirmed to Channel 4 News: "The new government has been clear in its commitment to end the detention of children. We are currently working to find an alternative that protects the welfare of children, without undermining our immigration laws. Clegg, who told his party conference last year that he wanted "to be prime minister", becomes the first Liberal leader to answer questions to the prime minister since at least 1922. When did the last Liberal leader take PMQs? Lib Dem HQ sparked a mini-blogosphere row by claiming on the social networking site Twitter that Nick Clegg would be the "first Liberal leader since 1922 to lead PMQs". Labour blogger Hopi Sen swiftly tweeted back that "LibDems don't know own history! [Lloyd George] not Lib leader then!" He then added: "Asquith last Liberal _leader_ to take Qs. Also PMQ's began in '61 so no-one did em in 22." Lib Dem blog guru Mark Pack then attempted to clarify things in a blog post. "First, in 1922 Lloyd George was Prime Minister, but as head of a coalition government, with Asquith still leader of the Liberal Party," he wrote. "So strictly speaking Nick Clegg won't be the first Liberal (Democrat) leader since 1922 to answer Prime Minster questions." Although Mr Pack conceded PMQs in their current form started in 1961, the practice of questioning the PM had been around for many years before that, he pointed out. "Whatever the terminology, today will see a historic event the likes of which last occurred a long time ago," he concluded. 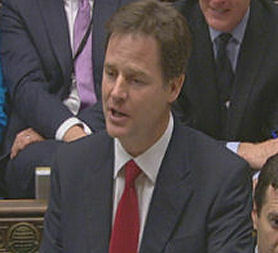 Shadow Justice Secretary Jack Straw faced Clegg from the Labour benches. Acting leader Harriet Harman followed convention by stepping aside for another senior figure while the Prime Minister is absent. Mr Straw, who said it would probably be his "one and only appearance" at Prime Minister's question time, challenged Clegg repeatedly on the scrapped loan for Sheffield Forgemasters. The shadow justice secretary urged the deputy prime minister to reconsider the decision to halt the £80m loan. But Sheffield Hallam MP Mr Clegg hit back, accusing the opposition of being in "complete denial" over the scale of the deficit inherited by the coalition government. Downing Street also later distanced itself from Mr Clegg's description of the Iraq war as "illegal", saying that the Lib Dem leader was expressing an "individual" view rather than speaking on behalf of the government. The stand-in PM told Jack Straw: "I'm happy to account for everything we are doing in this coalition government, which has brought together two parties, working in the national interest to sort out the mess that you left behind." "Perhaps one day you could account for your role in the most disastrous decision of all, which is the illegal invasion of Iraq." The Lib Dems' coalition partners the Conservatives supported the decision to go to war. Senior Tories George Osborne and William Hague, who sat next to Mr Clegg on the front bench, seemed to stay silent as he made the "illegal" accusation (watch their reactions here). "You suddenly wondered if Nick had forgotten that he was standing in:" broadcast executive Peter McHugh writes for Channel 4 News on Nick Clegg's first appearance at PMQs. "Within minutes he was displaying all the skills of those who had stood at the despatch box before him. His answers bore absolutely no relationship to the questions asked. "You could see he had not wasted all those years being ignored by Gordon Brown - now it was his turn." Shortly before PMQs, Lib Dem HQ put out a list of ways in which the party had influenced government policy, including ending child detention for immigration purposes. "These include everything from rolling back the surveillance state and giving people back their civil liberties, to prison and NHS reforms, fairer pensions, the ending of child detention and the scrapping of the third runway at Heathrow," the briefing said.